As Michael Flynn spent last fall campaigning as Donald Trump's top national security adviser, his little-known business partner supervised much of the foreign political work for Turkish interests that has boomeranged back on Flynn, now the target of a federal criminal investigation and congressional inquiries. Flynn's partner, Bijan Kian, joined the former chief of the Defense Intelligence Agency on Trump's national security transition team after the election. For Kian, who led most of Flynn Intel Group's research and lobbying for a Turkish businessman, the Trump transition role offered influence in the selection of intelligence agency candidates and access to internal discussions of U.S. national security policy. Flynn's mishandling of his dealings with Russia's ambassador to the U.S. led to his firing by Mr. Trump from his post as national security adviser and is now a prime focus of special counsel Robert Mueller's wide-ranging investigation into Russian contacts with the Trump campaign. But inquiries spawned by Flynn Intel's Turkish work pose added legal complications for both Flynn and his associates. Federal investigators are concentrating on possible criminal violations and a House oversight committee inquiry is examining Flynn's records to determine whether he lied to federal officials about his foreign contacts and payments. It is not clear whether Kian has been drawn into the expanding criminal probe, but he was deeply involved in Flynn Intel Group's creation, financing and operations, according to the Turkish businessman, people familiar with Flynn's company and records submitted to the Justice Department. And Kian's participation in the Trump transition — following his management of work that Flynn Intel acknowledged may have benefited Turkey's government — reinforces concerns about the adequacy of the administration's vetting process. A current Trump transition official said Monday night that Kian's records did not show his foreign work for Flynn Intel or that he planned to file with the government as an agent for his work for a foreign interest. "He did not indicate that to us in his transition documents. We would have no reason to know," said the official, who requested anonymity to discuss Kian's role during the post-election period. Both Kian and Flynn filed in March as foreign agents for the Turkish firm. Kian connected Flynn with his Turkish client, helped to negotiate their $600,000 contract and oversaw a documentary and an op-ed aimed at an opponent of Turkey's president Recep Tayyip Erdogan, said the client and several others who requested anonymity because of the ongoing criminal investigation. The client, Ekim Alptekin, also confirmed to The Associated Press that Kian worked for one of his Turkish companies at the same time he was working for Flynn Intel. "Content-wise, it was Bijan handling the day-to-day details," Alptekin told the AP during a recent interview in Washington. An Iranian-American businessman whose full name is Bijan Rafiekian, Kian did not respond to repeated attempts over two months by the AP to contact him by phone, email and visits to properties listed for him in public records. Alptekin told the AP he has not been contacted by federal authorities but has consulted with his U.S.-based legal team. "I'm very confident I engaged in a legal contract and was fully transparent from the beginning about what it entailed and what I was doing," he said. Flynn's attorney, Robert Kelner, did not respond to detailed questions from the AP. Kian's interests repeatedly intersected with Flynn's business ventures and political activities after Flynn, a former U.S. Army lieutenant general, left the government in 2014. 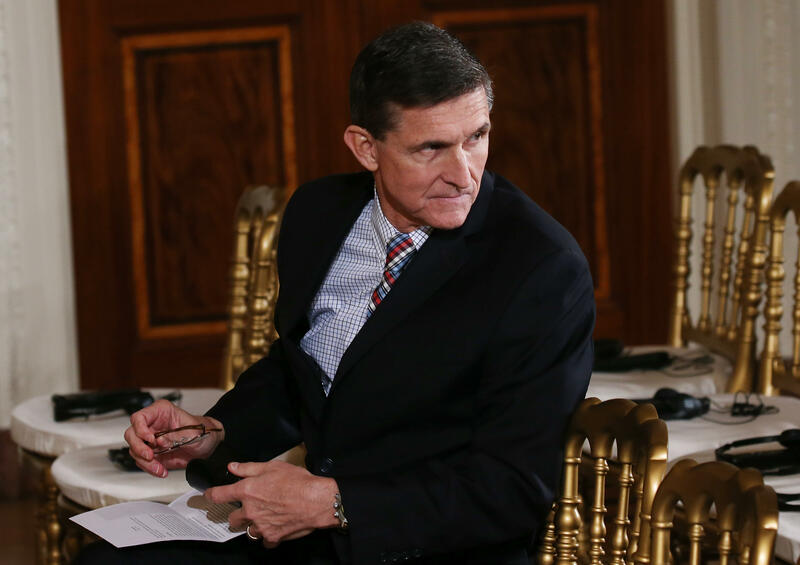 Kian, a former director of the U.S. Export-Import Bank, shared Flynn's strong public opposition to Iran's theocratic government and a common interest in the development of secure communications systems. Until Mr. Trump's election, Flynn served with Kian on the board of GreenZone Systems Inc., a technology firm Kian headed until April. Flynn and Kian co-authored a 2015 op-ed about ISIS militants, and attended galas put on by the Nowruz Commission, a nonprofit run by Kian and his wife promoting the Iranian Nowruz holiday. Alptekin was named a board director of that group in 2011. Soon after Flynn Intel ceased operations after Mr. Trump's election, Flynn and Kian joined the president-elect's transition team. Kian described his role on his LinkedIn profile as "deputy lead" assigned to the Office of the Director of National Intelligence. Kian said he provided "policy input, strategic guidance and operational counsel to prepare" candidates for the director of national intelligence, the CIA and other top officials. Two former transition officials said Kian was clearly close with Flynn and served as the retired general's sounding board. One official said Kian helped scrutinize then-Rep. Mike Pompeo before he was named Trump's CIA director. Another official said Kian was involved in transition discussions for the National Security Council and the director of national intelligence. That official added that Kian did not expect to get an administration post. Both transition officials spoke on condition of anonymity to discuss the transition's work. For the three months leading up to the election, Kian was Flynn Intel's linchpin, lobbying and managing contractors in the Turkish work. Alptekin said Kian was the intermediary who brought Flynn's firm together last summer with Alptekin's Dutch-based company, Inovo BV. Kian was also the "main one" representing Flynn Intel in contract talks with him last fall, Alptekin said, adding Flynn "wasn't involved at all" in the talks, though he signed the contract. Inovo ended up paying Flynn Intel $530,000 for research and lobbying aimed at persuading authorities to file criminal charges against Fethullah Gulen, a political foe of Erdogan. Flynn Intel disclosed its contract and other details of its Turkish work last March to the Justice Department, which regulates lobbying and other political activities for foreign interests in the U.S. Flynn and Kian were the only individuals who personally registered as foreign agents for Inovo. Kian and Alptekin had an existing business relationship when Flynn Intel began its foreign work. Alptekin confirmed Kian had been vice chairman of his Istanbul-based aviation company, EA Havacilik, since November 2011. Alptekin said he and Kian regularly strategized to build an aviation customer base. Alptekin has denied that any of Inovo's work was done at the direction of Turkey's government, but he is a member of a foreign trade board managed by the country's economic ministry. Alptekin said he first met Kian during Kian's stint on the Export-Import bank board for the Bush and Obama administrations between 2006 and 2011. Kian promoted U.S. business interests abroad for the bank, meeting officials in Russia, Saudi Arabia, the United Arab Emirates and other nations, according to State Department cables released by WikiLeaks. In his supervisory role for Flynn Intel, Kian was not always explicit about his ties to the firm, said several people who worked with him. Kian led a lobbying meeting last October with a representative of the House Homeland Security committee on behalf of GreenZone's secure communications products. But, as the AP previously reported , the session veered into a lobbying pitch for Flynn Intel, according to a U.S. official with knowledge of the meeting. Kian and others involved pressed for congressional hearings to investigate Gulen but the request went nowhere, the official said. Kian never identified who he was working for, the official said. Kian also recruited a freelance editor, Hank Cox, to fine-tune an opinion article in early November. The op-ed, praising Turkey's government as America's "strongest ally" against terrorism and pressing for Gulen's extradition, listed no author, Cox said. After he edited the article, Cox said, he sent it back, listing Kian as the writer. "I assumed since Bijan was the one who hired me, that he had written it," said Cox. Days later, Cox was baffled when he learned the op-ed had appeared under Flynn's name. "I was only vaguely aware of General Flynn at the time but I had no idea I was working for him or his company," Cox said. Flynn's firm told the Justice Department that Flynn, Kian and Cox drafted the op-ed based on the firm's research for Inovo. The firm said neither Inovo BV nor the Turkish government wrote or directed the op-ed, but Flynn Intel acknowledged it shared a draft with Inovo in advance of publication. Flynn's op-ed, published in The Hill newspaper on election day, drew scrutiny from the Justice Department's foreign agent unit. Pressure from those officials forced Flynn and Kian to file as foreign agents and led in part to the federal investigation now targeting Flynn.